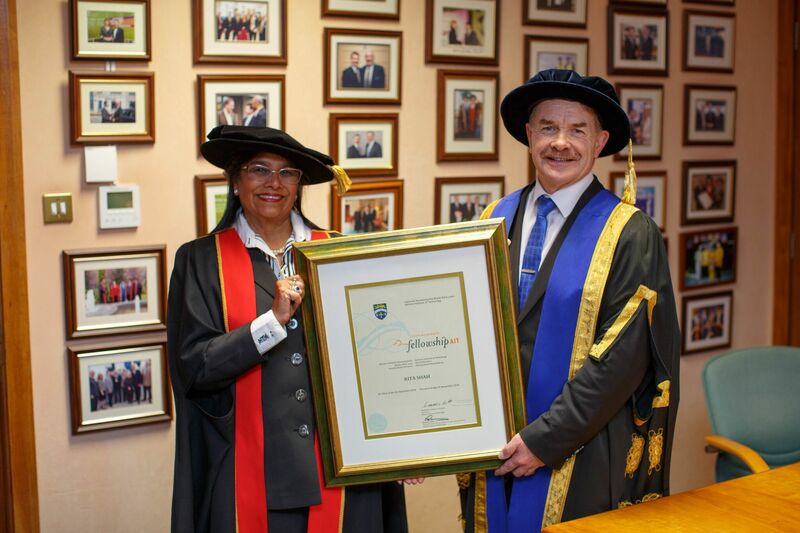 Successful Indian businesswoman and serial entrepreneur Rita Shah was honoured during Athlone Institute of Technology’s 2018 conferring ceremony with the institute’s highest honour – a Distinguished Fellowship. The title, which grants Rita life-long membership of the institute, was bestowed upon her for her significant contributions to Irish society. Rita is the co-founder of Shabra Plastics, a company that has transformed the Irish recycling landscape through the reprocessing of plastic waste film and post-consumer bottles. A company with modest roots, Shabra now boasts clients ranging from blue-chip companies to SMEs in a variety of sectors, including the food industry, local county councils and semi-state bodies, and has earned the reputation as one of the finest recycling plants in Europe. Over the last twenty years, Rita has grown the Co. Monaghan-based company into a recycling powerhouse with a firm eye on home and export markets. Through Shabra, Rita and her business partner, Irishman Oliver Brady, have provided job security and peace of mind to many employees and their families, but her journey was not without hardship and financial peril. The introduction of the plastic bag levy in 2002 forced Shabra to scramble, losing a turnover of €2million overnight as clients stopped purchasing plastic bags. Desperate to ensure the survival of their plant and the livelihoods of the staff that depended upon it, Rita and Oliver did as all smart business people do - they pivoted. They worked tirelessly with their clients on packaging projects and embraced recycling. Shabra now reprocesses and recycles in excess of 10,000 tonnes of plastic every year. While Rita is, as one might imagine, incredibly proud of what Shabra has accomplished from a business perspective, her employees are the wellspring of her pride. For Rita, Shabra’s employees are the heart and soul of the company; the key stakeholders that emanate the company’s values. She treats her staff as a genuine priority and as partners. For all its modernity and emphasis on innovation, there is something of the bygone age about Shabra. It is a company which styles itself as a family business, one that plays a major role in the social fabric of its local community. Rita also employs more than 170 people at the Moyvalley Hotel and Golf Resort, manages an ‘Urban Wellness’ skincare brand and runs Shabra Stables, a hugely successful stable based in Castleblaney, Co. Monaghan. Over the years, Rita has received many prestigious awards for her accomplishments in the business arena, including being named ‘Entrepreneur of the Year’, ‘Business Woman of the Year’, ‘Monaghan Business Person of the Year’, and ‘Top 25 Powerful Woman in Ireland’, the latter of which is her most recent accolade. A philanthropist at heart, Rita has given generously of her time and spirit over the years, though her charity work is often unheralded and unpublicised. Under the auspices of Shabra Charity, Rita has built schools in Kenya, provided shelter, security and educational scaffolding to hundreds of children, funded research into deadly diseases and helped upgrade the facilities at the Mater Hospital in Dublin. With the backing of the Shabra Charity, the Mater Hospital opened its Genetic Sequencing Department in 2017. This flagship facility is a first for Ireland and has the capability to diagnose and treat patients before symptoms have progressed which in turn mitigates the chance for negative outcomes. Previously these types of tests had to be sent abroad and could take anywhere between 18 months and 2 years to produce results. Awarding the Distinguished Fellowship, Dean of Faculty of Engineering and Informatics, Dr Sean Lyons commended Rita for her charitable endeavours, empathy for those less fortunate, business leadership and dedication to her employees. “Rita has given so much to the global community, whether it be helping those less fortunate through the efforts of the Shabra Charity, protecting the environment through her company’s recycling efforts, caring for employees, or just caring for people on a holiday in the Moyvalley Hotel, she genuinely believes that care is a word that has no boundaries,” he said. In receiving this honour, Rita Shah joins the ranks of esteemed luminaries such as former President Mary McAleese, Mary O’Rourke, Paddy Cooney, Don Panoz, Stephen Grant, Eamonn Coghlan, Barry McGuigan, Sonia O’Sullivan, Mark Rohan and Professor Dato’ Kamarudin Hussin and John Somers of Harmac Medical Products.